What is better than bringing the kids to the parks and letting them play silly at the fun playgrounds? Realising that there are ample family-friendly food options located within the parks! After a day out at the parks, sometimes the last thing I want to fret over is where to bring the family for lunch or dinner. 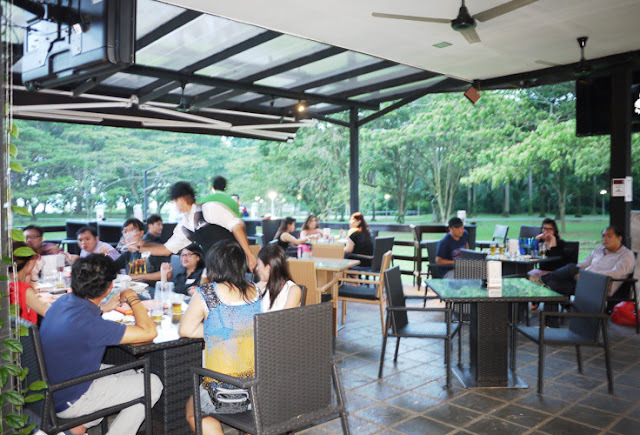 Thankfully, from MacRitchie to Woodlands to East Coast, there are plenty of cafes that families can have a meal or drink in the heart of nature. 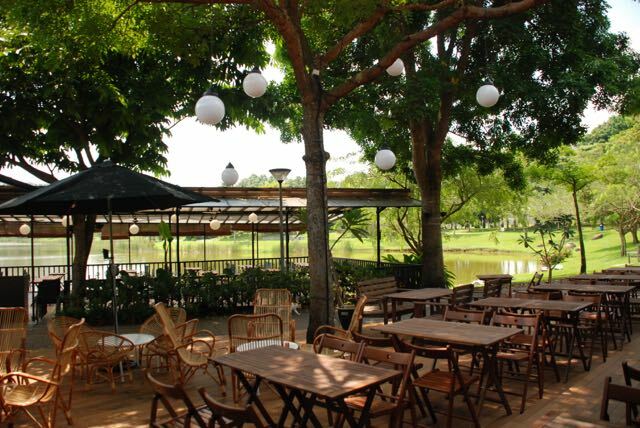 The restaurant comes with a beautiful verdant nature surrounding of the Pasir Ris Park. Offering an extensive range of Western cuisine, there is both indoor and al-fresco dining. I recommend going for the breezy outdoor seating which faces the seaside and provides a great view of the sunset. The dim lighting and rattan furnishings complement the nature setting. Since it opens til late, it is the quiet alternative to the usual noisy supper haunts in the east. Plus, Pasir Ris Park is equipped with a huge adventure playground with innovative play stations, a mini maze garden, a toddler playground and a mangrove boardwalk! Set on a Hill overlooking the blue waters of the Johore Straits, Beaulieu House is one of the very few restaurants that have a magnificent view of the sea. Originally the seaside house of a David’s family, who were in the mining business, the building is said to be even older than the Naval Base. 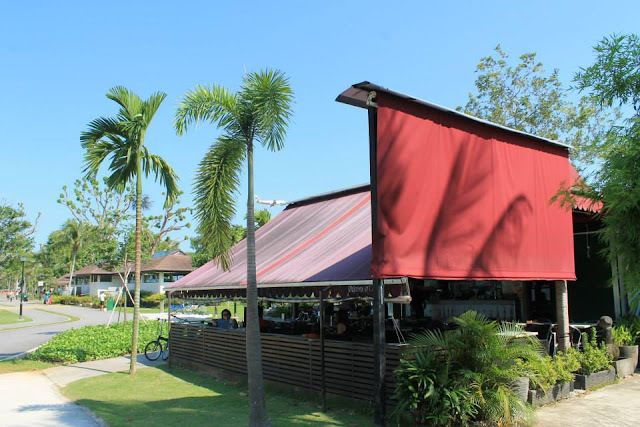 Serving Chinese seafood and western cuisine, it is located out in the most Northern part of Singapore inside Sembawang Park, a wonderful place fill with greenery and a favourite spot for families, thanks to the proximity of the Battleship playground! An alfresco café just beside the Changi Pitstop, the bistro is a convenient refuelling station for families after returning the rental bicycles. Indulge in the magnificent sea view that Changi Beach Park – the oldest coastal park in Singapore – has to offer and chow down food ranging from light snacks to main courses. Just steps away from the white sandy beach, the bistro is wonderful for families to soak in the splendour of the sea breeze and watch the planes fly by. 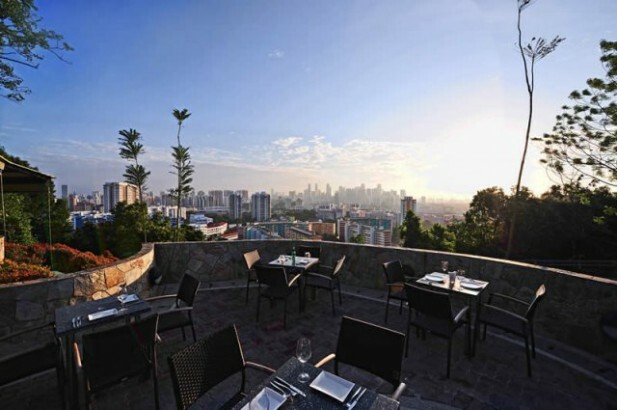 Perched on the top of Mount Faber Park, this friendly dining spot is tucked away in a cosy little corner and offers awesome panoramic views of Singapore. Sit back and enjoy the city view from the top of the hill while you pick your favourites from the western dining menu, including its Sunday Brunch with items starting from $18++. Set amidst the lush greenery of Singapore Botanic Gardens, Food For Thought is designed connect people with the pleasures of nature. To encourage family and community bonding, there are large tables and generous amounts of spaces inside and outside the eatery. Simply let the kids run free in the spacious outdoor playground which comes with a slide and climbing structures – it is fully enclosed so you can keep an eye on them easily. For those who prefer to stay within the comforts of the air-conditioned area, colouring sheets are available upon request as well. Nestled idyllically at Pond Gardens (formerly Bishan Park 1) of Bishan-Ang Mo Kio Park, GRUB boasts both dining in air-conditioned comfort and al-fresco - it is a tough choice, choosing between the industrial feel of its interior's bricked walls with black-rimmed, floor-to-ceiling glass facade versus the calming breeze in the midst of a luscious green wallpaper. As a parent, it was comforting to know that GRUB strongly believes in eating responsibly. Natural ingredients are used in its cooking, without the addition of MSG, artificial preservatives, additives or flavorings. Be sure to try its legendary Churros too... and burn off the calories at the nearby park after that! An open air halal restaurant at Chua Chu Kang Park, it serves a range of seafood and Chinese tze char dishes. Somehow, eating at the park gives off a different ambience. Perhaps it is due to the numerous playgrounds – both with sandpits and rubber mats – located just a stone’s throw away from the restaurant. Brimming with recreational activities for the whole family, Chua Chu Kang has four different areas, a small skate plaza, a wide range of fitness stations for the young and old, lawns and event spaces – making the restaurant the perfect pit stop after a day’s fun. The sister outlet of Rasa Istimewa C2K Restaurant at Chua Chu Kang Park, this is Singapore’s first restaurant located right in the middle of a pier. 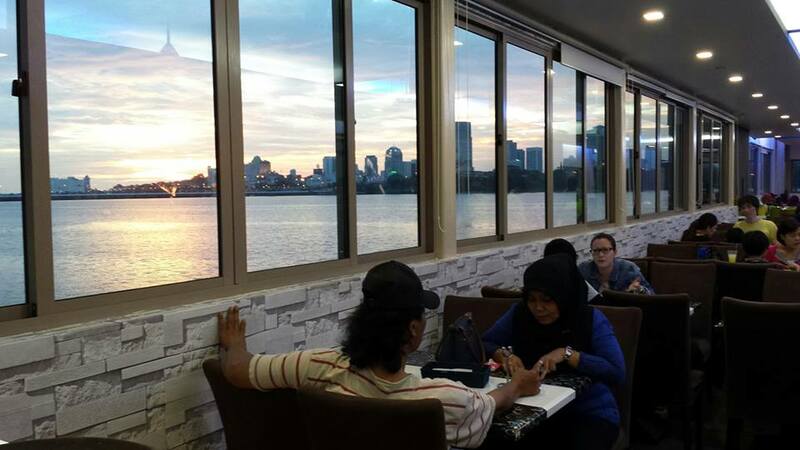 Enjoy the view of the Johor skyline and Singapore-Malaysia Causeway, while savoring its signature sumptuous dishes such assorted Muslim Seafood, Satay, Ikan Bakar, Western Delights and many others! The restaurant is located in Woodlands Waterfront Park, with its centrepiece attraction being the two-storey-high Sky Walk - a series of six crows nets that are interlinked by mesh bridges which kids can climb and cross – guaranteed to work up a ferocious appetite at the end of the day. A family friendly restaurant with homemade pastas, pizzas and bread baked in house and a selection of BBQ baby back ribs and a seafood boil with flower crabs, slipper lobsters and prawns that are great for sharing. Kids can run themselves silly on the grassy lawn in front of the restaurant while parents can keep an eye on them from the shade of the nearby verandah. If you want a bit of fun after your meal, a unique offering of the restaurant is the 15m plunge pool on its premise! Come Saturdays, Sundays and Public Holidays, head down for its International Buffet Breakfast (Adult $19nett & Child $9.50nett) from 8:30am to 12pm! Perched on a grassy knoll at the foot of Fort Canning Park in the canteen of the former River Valley Swimming Complex, this charming little outdoor cafe is central but yet away from the maddening crowd. Great to head to with the little ones after a walk in the tranquil Fort Canning Park, the café boasts a huge grassy slope in front for the kids to tumble around some more while parents reward themselves with a slice of decadent dessert. 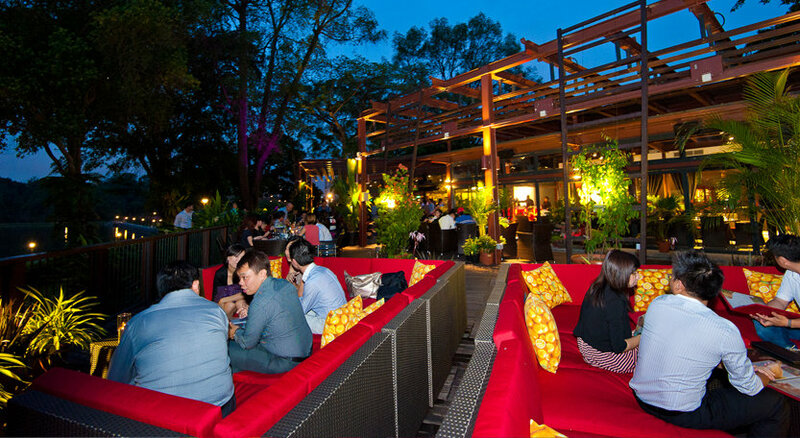 If you like dining in a forest setting, you will love Vava Bistro. Bask in the laid-back tropical nature of MacRitchie Reservoir Park. The bistro serves up a pretty western style fare, with hints of European. Food is decent but the atmosphere more than makes it up. If you do not want to contend with the humidity, heat or mosquitoes, grab a seat at its indoor lounge – you will still be able to partake in the beautiful scenery as the sun sets. However, it is recommended you burn off some calories by going on one of MacRitchie’s nature trails beforehand. You just cannot beat the location of this bistro. 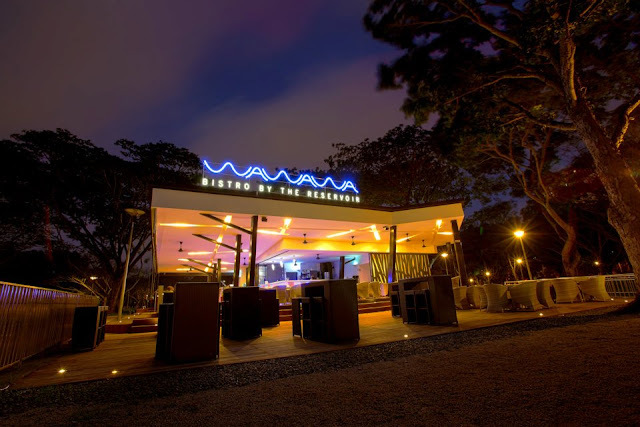 Situated by the banks of Bedok Reservoir, catch the spectacular view of the sunset when you grab a seat outdoors. With a menu that features moderately priced comfort food influenced by German cooking traditions, sit back and relax while your kids engage in a little runabout in the open space out in the front. Located at the edge of a 5-ha lake, Wild Oats is the company of lush tropic plants at Punggol Park. Soak in the atmosphere, dig into its local dishes or localised western dishes and wash everything down with a glass of ice cold beer. Chilling beside a lake overlooking the park has never been this relaxing. Families can head to the ‘Active Zone’ located at the southern part of the pond, where low impact 3-Generational fitness equipment suitable for users of all ages await.